I don’t know about anyone else, but I’m already salivating at the thought of all the tasty foods at Super Bowl parties, and it’s not even Christmas yet! One of my favorite, easy finger foods recipes that is delicious, but still low in Weight Watchers Points, are these low calorie Beef Sliders. By using half the amount of ground beef that I normally would and replacing it with fresh mushrooms, I’m still able to get a good, meaty flavor but with a lot less fat, calories and cholesterol. And they taste like they are 100% beef! I got this idea one evening after savoring one my absolute favorite Weight Watchers vegetarian recipes, my Vegetarian Philly Cheese Steak. The success of using mushrooms instead of steak in that sandwich was tremendously successful, so I decided to use a variation of that idea and use mushrooms in place of just some of the beef in these sliders. They were amazing. My husband couldn’t tell they weren’t all beef, and my kids gobbled them up. At just 7 Points for 2 of these thick, cheese covered sliders, including the bun, I’d say that’s a pretty fair bargain. These low calorie sliders would make a great Super Bowl Recipe, fun weeknight dinner idea, or a savory finger food to serve at your next party. Enjoy! 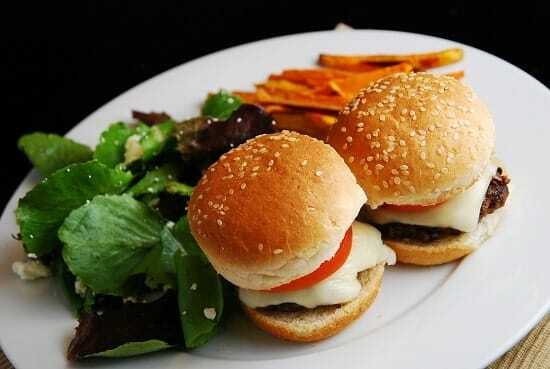 What a fun and tasty way to get more bang for your buck in these mini cheeseburger sliders. Juicy, delicious and just 7 Points for two of them. They make a great Weight Watchers Super Bowl Recipe idea, or a fun weeknight dinner recipe. In a medium sized bowl, combine ground beef, diced mushrooms, flour, soy sauce, garlic powder, and salt & pepper. Form mixture into 12 mini hamburger patties. Set a large non-stick skillet over medium high heat and spray with nonfat cooking spray. Place patties in the pan in batches of about 4, and cook until meat is thoroughly cooked through. About 4 minutes on each side. Then, top each patty with the cheese slice half, place a tablespoon of water into the pan, and cover with a lid until cheese melts, about 30 seconds. Place each patty inside a mini hamburger bun and top with condiments of choice. These were delicious, the mushrooms mixed with the beef gives the burgers a great flavor!